London, society is at turn-of-the-century levels, a King is randomly selected from the populace, and nobody takes politics seriously. Friends of the eccentric Auberon Quin are understandably shocked when he is selected as the new King of England... especially since his main focus is definitely not power ("Oh! I will toil for you, my faithful people! You shall have a banquet of humour!"). After bumping into a young boy with a toy sword, Quin decides to revive the old city-states of medieval times, with city walls, banners, halberdiers, coat of arms, and ruling provosts - all as a joke. (1) you never know what kind of a monarch you get from a hereditary monarchy: you might just as well pick a monarch at random. (2) Auberon Quin is as mad as a hatter - at this stage there appears to be no method in his surrealistic sense of humour. And then he is picked on as the next king. As king, however, there is method in his madness and purpose in Chesterton's wit. The King is determined to take nothing seriously, and politics the least of all. One day he hits on the idea how amusing it would be to give autonomy to the boroughs of London, to revive their antiquity (he makes up what might be the historical origin of names like Kensington, Bayswater, Notting Hill etc) and to equip them with medieval coats of arms and a medieval set of officials like High Provosts who may enter his presence only when escorted by a group of halberdiers in the liveries designed by the King. And that is what he does. After ten years, however, conflict breaks out between some of these boroughs, when businessmen plan to drive a highway through three of them, from Hammersmith to Westbourne Grove. Adam Wayne, the passionate 19 year old High Provost of Notting Hill, objected to the demolition of a little street in the borough. It is not only a question of independence: it is a question of maintaining a stand against Modernity. To the King's confusion, what Quin had constructed as a matter of whimsical amusement, Wayne was taking as a matter of deadly seriousness, a sacred ideal worth fighting for. With burning and romantic local patriotism, Wayne felt for the spear-headed railings of Notting Hill the passion that poets brought up in the country felt for the hedges of their fields. (And today's Notting Hill readers like myself, who have seen small convenience shops disappear one after the other to make room for commercially more profitable enterprises, like Tesco stores or coffee shops, chic restaurants and boutiques, will recognize what stirred Chesterton in 1904!). Wayne wins round the doubtful citizens of Notting Hill with Chestertonian arguments; and there is then a long knock-about account of the battle between his army and their opponents (largely told by the King who, for some odd reason, has temporarily turned journalist). Against impossible odds, greatly outnumbered and apparently out manoeuvered, Wayne's men triumph. But they are generous in victory, honour their opponents and respect that they have their way of life just as Notting Hill has its own. Wayne envisages peaceful coexistence between all these boroughs. Another twenty years pass. The other boroughs developed their own local patriotism. But, against Wayne's wishes, the men of Notting Hill no longer honour their former opponents; peaceful coexistence is at an end; and a new battle is the result. Wayne knows that this time the men of Notting Hill, stripped of the nobility of their cause, will be defeated; and so, after another epic battle, they are. The coda, a dialogue between the ghosts of Quin and Wayne, is heavily philosophical. Chesterton seems to suggest that the each of them had represented something - romantic fanaticism on the one side, romantic fantasy on the other - that transforms the dreary prose of modern cities into poetry. But I must say I could not make much sense of the rest of Chesterton's reflections. "The Napoleon of Notting Hill" is probably the most absurd novel I've ever read. The author, G K Chesterton, was a colourful, verbose and highly eclectic British intellectual. He supported the Boer and the Irish, opposed the suffragettes, and collaborated with Guild Socialists, only to become entangled with the notorious Catholic fundamentalist Hilaire Belloc. I honestly admit that I don't quite understand the man! Still, there seem to be some unifying themes in Chesterton's voluminous writings. The most obvious is traditional Christianity, first in the form of Anglicanism, later as Catholicism. The reader shouldn't be surprised if some of the characters in his novels turn out to be angels, the Devil, or God himself. Second is a kind of populism. Chesterton emphasizes common sense, the opinions of the common man, the everyday life of the common people, etc. As one of the characters in "The Napoleon of Notting Hill" puts it: "The human being, the common man, whom mere geniuses like you and me can only worship like a god". In his economic writings, he idealizes the peasantry. In other contexts, Chesterton says that life in the city is intrinsically interesting, and calls on realist writers to relate to it. Finally, there is a search for authenticity, as opposed to the artificial greyness of modernity and the tyranny of the Zeitgeist. Somehow, Chesterton believed that this authenticity could be found among ordinary people, hence making a connection to his populism. All three themes are present in "The Napoleon of Notting Hill", published in 1904 and one of Chesterton's earliest novels. Both the setting and the plot are completely absurd, although the absurdity is revealed to have a point at the very end of the story. The setting is a futuristic Britain. The nation is a dictatorship, but nobody seems to care. Free speech is outlawed, but nobody notices, since nobody has anything important to say anyway! The standard of living is quite high, and the police have been abolished, since there is no crime. The king or dictator is chosen at random by lot. The whole world has been taken over by globalization, except Nicaragua. In other words, this society of the future is a parody of the greyness, dullness, lethargy and the creeping statistic Chesterton saw (or think he saw) in Britain during his own lifetime. Adam Wayne, the Lord High Provost of Notting Hill, the smallest and least significant borough in London. Before long, Wayne starts an absurd war with the other boroughs, and eventually succeeds in establishing "the empire of Notting Hill". Throughout the novel, we are lead to believe that Wayne is raving mad, and his actions certainly seem to parody nationalism and local patriotism. Only at the end is it revealed that Wayne is actually "the good guy", perhaps even an angel from Heaven. Both Quin and Wayne are overthrown by the people, but they join fortunes and wander off together. The message of the novel is that nationalism and local idealism, which looks absurd to modern eyes, aren't artificial but real, more real than the dull greyness of the modern. Local patriotism is authentic, is part of what humanity is really all about. Chesterton was a "Little England nationalist" and called for extensive decentralization. Another point raised by the novel concerns the relationship between humour and seriousness. The futuristic society described by Chesterton is frankly boring, but when Auberon attempts to protest this state of affairs, he can do little else than frivolity. Indeed, our "post modern condition" is characterized both by conventional, mass boredom and frivolous mass entertainment. The two things aren't antipodes, but twins. This is Auberon's problem in the novel. Wayne's problem is seemingly the opposite: he takes even the absurd deadly seriously, and hence turns into a cultish fanatic. In the end, however, it turns out that Wayne knows the solution to the problem: humans need to be both humorous and serious, and there is no contradiction between authentic laughter and authentic seriousness. It may sound like a bland message, until you start watching TV! However, Chesterton's novel also contains a cautionary note: "When dark and dreary days come, you and I are necessary, the pure fanatic, the pure satirist". Is the world ripe for a real Adam Wayne? Imagine a 1984 London where society has frozen at turn-of-the-century levels, a King is randomly selected from the populace, and nobody really takes politics seriously. Of course, it only takes one wise, weird little man to turn all of that on its head. G.K. Chesterton's magnificently absurd comic novel explores a common theme in his books -- a person who entertains himself with an absurdly serious world -- in an increasingly heated situation where the little boroughs of London have become warring kingdoms. Not much in the way of sci-fi, but a delicious little social satire. Friends of the eccentric Auberon Quin are understandably shocked when he is selected as the new King of England... especially since his main focus is definitely not power ("Oh! I will toil for you, my faithful people! You shall have a banquet of humour!"). After bumping into a young boy with a toy sword, Quin decides to revive the old city-states of medieval times, with city walls, banners, halberdiers, coat of arms, and ruling provosts -- all as a joke. G.K. Chesterton was no H.G. Wells when it came from trying to imagine the future --- the 1984 London he imagined was pretty much the same, technologically and socially, as the London of 1904. It's the message that important in this tale, as personified first by a deposed president and then by Wayne -- pride and patriotism in one's country and culture, especially a small one, is something to be prized. And Chesterton handles this concept with a sense of humour worthy of Quin, outright mocking the respectable and boring ("The provost of West Kensington is mad because he thinks he is respectable, as mad as a man who thinks he is a chicken!"). The humour starts off fairly ordinary (Quin standing on his head as he's declared king) and moves into more sophisticated realms with the elaborate medieval games. It would be scary to contemplate, if it weren't so hilarious. The greatest satire is in this future society itself, and it's occasionally scary to contemplate. With his knowledge of human nature, Chesterton predicts ennui, complacency, disdain of religion, cultural indifference, and a public oblivious to the mad wackiness of their leaders because they just don't care. It hits a little too close to home. His writing is full of colour and striking description ("... a blue and gold glittering thing, running very fast, which looked at first like a very tall beetle"). And while the battle of Notting Hill doesn't really pull you in, the powerful speeches that are given during important scenes -- such as when Quin talks to Wayne about the damage his joke has caused -- are among Chesterton's best dialogue. Auberon Quin is a pretty fun character, acutely aware of life's absurdity and determined to have as much fun from it as possible -- but he becomes a bit more serious at the prospect of people being killed. Wayne is the complete opposite -- young, passionate, intense, and vehemently patriotic. He's set apart from all those stuffy codgers because his love is not for respectability and normalcy, but for his home of Notting Hill. 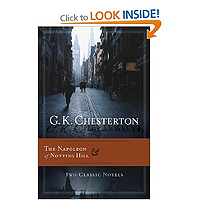 Chesterton may have gotten the future of England all wrong, but "The Napoleon of Notting Hill" is still a wildly amusing little satire, with two very different heroes and a very unrecognizable London. A deserving classic.